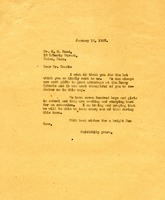 Letter to G. E. Hood from Martha Berry thanking him for the hat he sent to the schools. She informs him that they can always use such gifts. She also informs him that they have seven hundred students attending the schools and she hopes that they can keep them all at the school this term. 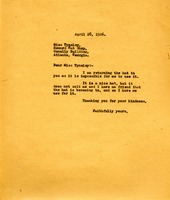 Letter to Miss Tynsley from Martha Berry in regards to a hat that Miss Tynsley gave her. She thanks Miss Tynsley for her kindness in giving her that hate, however she is returning it because it does not suit her or anyone she knows and is therefore returning it to Miss Tynsley. Martha Berry expresses her condolences on the death of the Meachams' son and her thanks for the clothing they sent to the school. 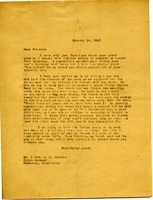 She shares a story of a boy who benefitted from their donation.